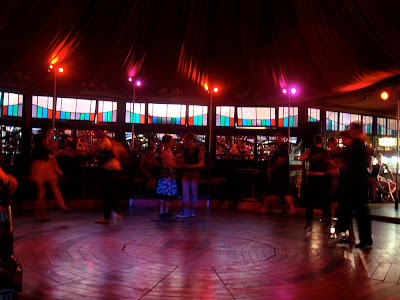 On Monday night I went to the Garden of Unearthly Delights for a night of swing dancing at the Deluxe Tent. I had a grand ol' time Lindy Hopping and what-not (I even got one gent to do a foxtrot with me because I had never done it before and thought it would be fun to give it a go - it was!) to some great live music from Lucky Seven, followed by a DJ set by the lovely Lili la Scala. I mentioned the other day that I've been in a bit of a funk and part of that was that I had no desire to go social dancing, lately, but I've overcome it and had a simply lovely night. Outfit details: hair flowers - discount store; earrings - gift; necklace - Fisherman's Wharf Markets; sweater - Salvo's; skirt - op-shopped; shoes - KMart. Outfit details: neckerchief - Goodwill; blouse - Cotton On; 1940s repro jeans - Freddies of Pinewood; shoes - KMart. Coincidentally, I am listening to the Easy Virtue soundtrack and just remembered one of the instrumental pieces on there is the Easy Virtue Foxtrot. Now I am going to play a bit of ukulele and then get ready for another night out. Hope you're all having a happy Wednesday! Cute outfits! Glad you are feeling better. Have fun dancing! you are adorable! 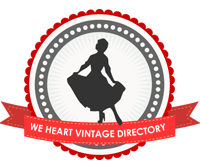 i love your blog so much! This place is so cool to dance. oh fun fun fun! 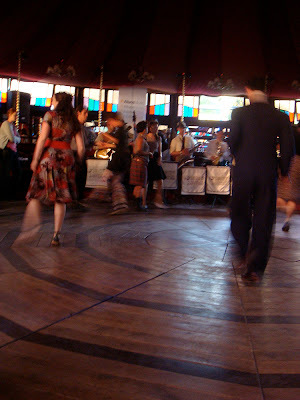 I always just go to my swing class, but i never stay around for the social dancing afterwards! I really should, shouldn't i! bellisimama: Aw, thank-you so much. I'm glad to hear it! The Big Mama Introspection: Yeah, it's great! Miss Emmi: Thanks. =D Yes! Watch it. Hehe. Oranges and Apples: Ooh, yes, you must stick around for social dancing. Baroness: Thanks. =] I love the soundtrack, too! Wonderful outfits! I love that pink sweater!! The tents looks great! What a wonderful setting for dancing. The only thing that gives them away as tents is the floors; a little bit uneven. Doesn't matter much, but isn't it surprising when the heel cathes one of those edges? =) Constant problem with dancefloors in tents! Trunky doo seems like a very fun Authentic Jazz routine, I'd love to learn it. Next up however, is the big apple routine in two weeks! So looking forward to doing some AJ! The first outfit is really cute! You look adorable in it!